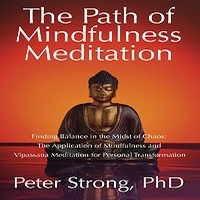 I am a licensed registered professional psychotherapist in private practice and I offer Mindfulness Therapy via Skype to help you overcome anxiety, depression and other common psychological-emotional problems using a variety of mindfulness methods that I have developed over the years and that I describe in my book, The Path of Mindfulness Meditation (available on Amazon in paperback and kindle editions). Most of my clients come to me after trying conventional psychotherapy and counseling and often after trying prescribed antidepressants and anxiety medications, with little benefit. The Mindfulness Therapy approach is a very positive approach that is designed to give you the tools you need to manage your emotions more effectively. Most of my clients see marked improvements after as few as 3-4 online Skype sessions with me once they start applying the methods that I teach. Do please feel free to contact me if you would like to learn more about online mindfulness therapy via Skype and if you would like to schedule a therapy session with me. Online Mindfulness Therapy for Anxiety – Mindfulness Therapy is an exceptionally effective treatment for anxiety because it teaches you how to overcome the compulsive blind impulse to become anxious. Online Therapy for Panic Attacks will teach you how to break free from the debilitating effects of panic attacks. Online Mindfulness Therapy for Agoraphobia – Mindfulness Therapy is especially effective for agoraphobia, and provides an excellent option if you cannot leave home. Online Mindfulness therapy for OCD – overcoming habitual reactive thinking and behaviors. Learn how to manage intrusive thoughts. Online Mindfulness Therapy for Depression – Learn how to overcome reactive thinking and develop better self-confidence and self-esteem. Online Marriage Counseling. Learn how to overcome conflict and patterns of emotional reactivity that are so destructive to your personal relationships. Learn how to be at ease with each other and allow love to flourish. So are you interested in getting started with online therapy? If so simply e-mail me. That’s the first step. Simply send me an email using the contact form and ask any questions you have about online therapy and if it’s suitable for you and we can schedule a session at a time that works for you. So I’m based in Colorado and I see people through the day. So take that into account when you’re arranging a session with me. So Colorado is Mountain Time and if you’re living on the East Coast it will be Eastern Standard Time, just two hours ahead of me. Or if you’re on the west coast then that will be one hour behind me. I see people throughout the U.S. and also Canada. But I also have a lot of clients in the UK and Western Europe. And that often works quite well because, of course, it will be evening time for you in Europe, so that doesn’t conflict with your work schedule. During sessions, which are always through Skype, I will teach you how to work with your emotions using the techniques of mindfulness that I have developed and found very successful over the years. Basically, I’m going to focus on giving you the tools to work with your emotions so that you can break free from chronic anxiety or depression or OCD or even addictions. The principles are always the same. And that is it’s one of learning how to break free from reactive thinking and how to bring compassion and develop a friendly relationship with those parts of your mind that are suffering. You have to develop a compassionate relationship with your emotional pain, in order for it to heal effectively, and this is one of the key features of Mindfulness Therapy that I offer. It is a combination of breaking free from reactive thinking and developing a compassionate, friendly relationship with those emotions that are trying to heal within you. It works extremely well when you incorporate these two principles and most of my clients see dramatic changes within three to four sessions, sometimes less. Certainly the first session will give you a very good experience of what to expect and Mindfulness Therapy. So contact me if you’d like to get started. The the first session is always a trial session, which means that if it doesn’t work for you, if this approach doesn’t feel right, there’s no charge. It’s basically my intention to provide you with something that works for you and so this is quite different than conventional psychotherapy or counseling. And that’s another point for you to consider. We don’t spend a lot of time talking about family history or even talking about your emotions. Rather we focus on seeing how they work in the mind, we bring mindfulness to examine how they work. What is the mechanism that produces your anxiety or depression. That’s much more relevant than just talking endlessly about your emotions. We have to change the underlying process that causes your anxiety or depression or addiction. So the main thing is, send me an email. Let’s get started. Let’s schedule that first session so you can see for yourself just how effective Online Mindfulness Therapy can be. Thank you. Mindfulness Therapy provides one of the best forms of psychotherapy available for working with anxiety and depression – You can expect to see significant improvements after 3-4 sessions. Session Times: 8am, 10am, 12pm, 2pm, 4pm MST, Boulder, Colorado. Available world-wide. Let me know what days / times work for you and I will check my availability. STANDARD FEE: $95 / hr or $110 / 90min. SLIDING SCALE FEES $65 – $95 / hr. If you cannot afford my standard fee, I will always try to work with what you can afford. Client selection depends on a number of factors; the most important being your commitment to personal transformation.